Different lacrosse leagues: Why can’t we all just get along? Not too tough to see where he stands. I posted a sarcastic reply saying “Nice to see the lacrosse community working together for the good of the sport”, and then got into a short conversation with someone who agreed with Mr. Richardson. But quite honestly, what he said was not what I was arguing about, it was (a) how he said it, and (b) the fact that he said it at all. Are the NALL or CLax good for the sport of lacrosse in North America? Maybe, maybe not, but that’s not my issue. Mr. Richardson is certainly entitled to his opinion. He is not required to support all other lacrosse leagues just because they play lacrosse. But when your twitter handle is “BelliesGM”, you are speaking on behalf of the team and to some extent the WLA. In my opinion, if you’re speaking with that kind of authority, you need to be careful what opinions you post. I’m going to guess that Mr. Richardson has been around the sport of lacrosse for a long time, so I’m sure he has all kinds of constructive criticism he could give the NALL and CLax, but openly and publicly mocking them with comments like “your logos make me barf” is hardly constructive. If you don’t like what they’re doing, you don’t have to post anything. This paragraph is going to piss some people off, but there’s also the irony of someone working for a team called the Salmonbellies calling some other league “bush”. I know about and respect the history of the team, which has been around for well over 100 years and has won more Mann Cups than any other team. But if you ask any sports fan who doesn’t follow lacrosse, Salmonbellies would rank right up there with the Banana Slugs in the list of “bush league” team names. Something that has always confused me as a lacrosse outsider is that there are a number of different lacrosse leagues, but they don’t work together. When the MLL came to Toronto in the form of the Toronto Nationals, there were Nationals ads at Rock games. But when I went to my first Nationals game, there was no mention of the NLL at all. I knew that in the past these leagues basically ignored each other, but it never made sense to me and I thought that maybe this was the beginning of a new era in both leagues. But since that first Nationals season, there has been no mention of the MLL or the Nationals (now based down the road in Hamilton) at Rock games at all. Why doesn’t the MLL look at each NLL game as “10,000 lacrosse fans trapped in an arena and forced to look at whatever advertising we want to show them”? They could have ads in every NLL arena with an MLL team nearby near the end of the season saying “NLL season is almost over – if you love lacrosse and want to see more, come on out to games in the summer and see your favourite NLL players!” The NLL could do the same at MLL games. Give season ticket holders of one team discounts on the tickets for the other, and everyone’s happy. Instead, it seems that the MLL views the NLL as “that cute li’l indoor league where players go in the winter to keep their skills sharp for the next MLL season”, and vice versa for the NLL. It’s the same with the WLA / MSL and the NLL. The NLL seems to view themselves as the “major league” and both the WLA and MSL as the “minor leagues” though if you ask any Canadian lacrosse player, many of them will tell you that given the choice, they’d rather win a Mann Cup than an NLL championship. These leagues seem to want nothing to do with each other. Why is it so difficult for these leagues to work together for mutual benefit? If they don’t want to work together, fine but why can’t they each at least acknowledge the other’s existence? The NLL and WLA/MSL don’t compete, and the NLL and the MLL don’t compete – their seasons don’t overlap at all and there are many NLL players who play in one of the other leagues in the summer. I can see the WLA/MSL and the MLL not having any kind of relationship with each other because their seasons do overlap so there is some competition for players. But other than the Hamilton Nationals, there’s no geographic overlap between them anyway so there’s no competition for fans. There’s no geographic overlap between the WLA and CLax or between the WLA and the NALL, so it’s unlikely that these leagues will form partnerships anyway. But with Mr. Richardson’s comments, it looks like the WLA is openly hostile towards these other leagues. The lacrosse community is already broken in two – field people and box people. Now we seem to be fragmenting the box lacrosse community itself into disparate groups that want nothing to do with one another, and I don’t see how that can be good for lacrosse in general. With one fewer team in the NLL this season, 23 players who were good enough to play in the NLL last year are now out of work. Could we put together an NLL-calibre team with the players not listed on one of the recently-released 2012 rosters? Let’s have a look. I started with everyone listed in an Out list on my roster change summary who wasn’t also on an In, Holdout, IR, or PUP list and who hasn’t (to my knowledge) officially retired, added in the former Blazers players who are not on a roster, and then narrowed it down. Note that some of these guys are playing in CLax or the NALL, or are not playing on an NLL team for some other reason (i.e. they were not cut). Obviously there’s no Doyle / Grant / Dawson type superstar players, but that looks to me like a pretty good lineup. A decent offense, lots of experience on the back end and in transition, a great face-off guy, and two goalies named Matt. These guys aren’t going to be challenging for the Cup this year, but there have been real NLL teams (Cobras, Rebel, Smash, early Rush) that won fewer games than this group would. Update: Alex Turner should be on this team as well. Not sure how I missed him. If I had to replace one of the forwards with Turner, it’d probably be Maddalena or Martin. Here is a complete list of the changes in rosters from the end of the 2011 season to the roster lists just announced. Players on the Holdout, Physically Unable to Perform (PUP), or Injured Reserve (IR) lists may be moved to the active roster before the season begins. Names for each list are in alphabetical order. Reports say that Hawksbee will be ready to play by the time the season starts, but Dalgarno is out for the year due to job commitments. It was “announced” on twitter yesterday that the Philly Wings will be trying an interesting PR move during a game this season: having the players’ twitter handles on the back of their jerseys rather than their names. This hasn’t been officially announced anywhere, but it seems to have been confirmed by a number of players. Judging from the reaction on twitter, there are a few people who like the idea, but the majority are unconvinced that this is a good idea. OK, that’s generous – most people who tweeted about it hate the idea, including players such as Andrew McBride and Jeff Zywicki. I was in that camp as well – at first. I have to say that the idea is growing on me. I still can’t say that I love it but if done right, it could have a net positive effect. It’s at least somewhat easy to tell who the player is from his handle. Stealth owner Denise Watkins uses the twitter handle @drgnqwn which may make sense to her, but I have no idea what it means, and if I saw something like that on the back of a jersey, it wouldn’t be obvious who it is. Is this the kind of thing the NHL or MLB would do? No. But the NLL isn’t the NHL, as much as people would like to think it is, or could be. Maybe someday it will be and maybe not but either way, we ain’t there yet. Trying to get there requires getting more exposure, and this should help. Is it completely positive exposure? I’d have to say no considering the number of negative comments I saw on twitter, but this issue was compared to the infamous Boston lap dance competition a couple of years ago, and I don’t think this is the same. That was completely inappropriate and should have been flagged as a bad decision right away. This isn’t inappropriate, just… unusual. It may also turn out to be a bad decision, but we won’t really know until it happens. Some have said that any exposure is good exposure and I think the lap dance thing disproved that notion to some extent, but even if you think this is a silly idea, it’s not likely to make you decide to stop bringing your kids to the games. Even if it’s a complete flop, it’s only for one game. The Wings should thank their lucky stars that Drew Westervelt didn’t do like I did and just use his full name on twitter. @Dwesty1426 may not be as obvious, but @DrewWestervelt might not even fit on the back of the jersey. Who’s the most dominant player in the NLL? Well, that’s a pretty vague question – what do we mean by “dominant”? You can’t really argue with fact that Wayne Gretzky, Bobby Orr, Tiger Woods, Roger Federer, in their primes, were dominant. Not only was it a given that when you looked at whatever statistics they excelled in that they would be near the top, but you could assume that unless something really unusual happened, that they would be at the top. When I was in hockey pools during high school, we decided that nobody was allowed to choose Wayne Gretzky because whoever got him had an unfair advantage. That’s dominance. But it doesn’t always mean the absolute best player; Dennis Rodman was never the best player in the NBA, but he dominated the rebound category for years. This is not the dictionary definition, but for purposes of this article, I’m going to describe a player as being dominant if they are the best at something, and significantly better than second place. A player could be dominant in one aspect of the game (face-offs, for example) but not as much in another aspect (goal-scoring). But even if it’s a difficult question to conclusively answer, it’s fun to think about. Let’s look at a few candidates from the past and present. Gary Gait won six MVP awards, including five in a row, and led the league in scoring seven times. You could certainly make an argument for him as the best offensive player of all time, but as soon as you mention Gary, you have to mention his brother Paul as well as John Tavares. As good as Gary was, he wasn’t significantly better than Paul or JT so “dominant”, using my definition above, doesn’t really apply. Perhaps you could put all three together and say that they were collectively dominant. After all, one of these three won the MVP award every year from 1994 until 2003, and one or more of them led the league in points from 1991 until 2004. Dallas Eliuk and Bob Watson are the top two goaltenders in NLL history, and few people would argue with that. The argument over which of those two was the best will likely never end. But that fact alone likely makes it impossible to say that either was dominant. They don’t really fall into the same category as the Gaits and Tavares, in that both were always among the best in the league in any given year, but it wasn’t a foregone conclusion that they would be #1 and #2 in some order every year. Brodie Merrill is one of the top loose balls guys in the league now, having led the league in 2007 and again last year. He’s also won the Transition Player of the Year award twice, and Transition Player of the week nine times in five years. Those are pretty impressive numbers, and you could make an argument for him being the best transition player in the league. Jeff Shattler won the award last year, but that was a little weird since Shattler played offense far more than transition. Is Merrill really that much better than Shattler, Paul Rabil, or Geoff Snider? No, but when it comes down to Transition Player of the Year voting, you can safely assume that Merrill will be right up there. I may not put him in the “dominant” category given my definition above, but he’s pretty close. Geoff Snider probably comes as close as any active player because he’s so good in a couple of different categories. He’s led the league in loose balls in three of the past four years, he set records with the highest face-off percentages in league history (75% in 2007 and 73.8% in 2008), and he’s one of only two players to ever reach 100 penalty minutes in a season (Rory Smith is the other). If you’ve ever seen this guy in the face-off circle, he’s absolutely unbelievable. Sure he had the second-highest percentage in the league last year, but his brother Bob only beat him by about one percentage point, while he beat third place by almost nine. 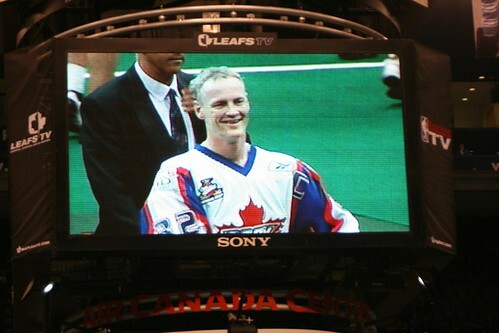 So who’s the most dominant player in any category in NLL history? Even given the vague criteria above, there is really only one choice. Jim Veltman led the league in loose balls for the first fourteen years of his career, from 1992 to 2006 (minus 1997, when he didn’t play). He has been retired for three full seasons now, and is still by far the all-time leader in that statistic. Nobody else is even close. Veltman scooped 2417 loose balls over 194 games, an average of 12.5 per game. In 25 playoff games, he averaged 13.2 per game. The next closest on the all-time list is John Tavares, with an even 2000 in 58 more games. Tavares’ average is only 7.9 per game, so he’d have to play 53 more games, more than three seasons, at that pace to match Veltman. This means that if he continues to play, Tavares will set the record during the fifth game of the 2015 season at the age of 46. Both Snider and Merrill have higher loose-ball-per-game averages than Veltman, Merrill with 12.8 and Snider with an amazing 14.1. But they will have to play for six more full seasons before they reach Veltman’s record – and that’s assuming they keep up their current pace and play in all 16 games every year. Interestingly, at their current paces, they’d reach the record at almost the same time – Merrill in 94 more games, Snider in 97. If you’re keeping track, that’s sometime in the 2018 season. Welcome to my new lacrosse home at nllchatter.com. For those of you who don’t know me, my name is Graeme Perrow, and I’ve been a Toronto Rock and National Lacrosse League fan since the 2001 season. I have been writing on my own personal blog (called Cut the Chatter, Red Two – see what I did there? They both have Chatter in the name! I’m so clever) for almost seven years, though not everything was about lacrosse. Over the last year or two, I’ve started writing a lot more about lacrosse, both on my blog and on a couple of other sites as well. A number of people who read my personal blog aren’t lacrosse fans, and the people who read my lacrosse postings may not care about my non-lacrosse articles, so I thought it was time I created my own place on the web to publish stuff specifically about lacrosse and the NLL. I’m glad you’ve found it and I hope you enjoy it! I am a fan of the National Lacrosse League, so the majority of the articles I post here will be on the NLL and its teams and players and such. I may touch on other lacrosse leagues as well from time to time, such as the MLL, CLax, and NALL. I am a Toronto Rock season ticket holder, so I attend all of the Rock home games and I will be posting a game review after each one. I will also try to post game reviews of the Rock’s away games, as long as I have a chance to watch the game on TV or online. I live fairly close to Buffalo as well so I may make it down to a few Bandits games and post reviews of those, as well as any other games I watch. I expect to write one or two articles a week, maybe more, during the season. During the off-season there won’t be much unless there is some news like a trade or announcement from the league, though I don’t expect to go completely dormant. Before the season starts, I’m planning on doing some preview articles, listing the changes to each team since the end of last season and how I see things unfolding in the coming season. I will also do all the normal sports blog stuff like analyzing trades and rule changes; making predictions on standings, playoff results, and award winners (and pointing out when I get things right while ignoring when I get things wrong); complaining and the occasional whine; and stuff like that. I love stats, so there will likely be a fair bit of looking over statistics, though I promise there won’t be any serious math going on. There may even be pictures, videos, interviews with players and executives and such, who knows. I make no apologies for being a Rock fan, but I do like to think of myself as fair and relatively unbiased. I’m not one of those homers that thinks every penalty that goes against my team is a bad call, every goal scored by an opposing player is lucky, and every opposing player that checks a player on my team is dirty. I will also do less whining about referees than you might find elsewhere (though I did not say “no whining about referees”). Please feel free to call me out on this if you think I’ve said something that goes against these “policies”. Comments on articles are welcome and encouraged, whether you agree with what I say or not; in fact, sometimes it’s more fun if you disagree. I will not censor or delete comments as long as they are civil, but comments that contain personal attacks will be deleted. You can also email me at graeme AT nllchatter DOT com and follow @GraemePerrow on Twitter. I hope you enjoy my little slice of the lacrosse world, and let the chatter begin!